Foreign Affairs Minister Walter Mzembi has told Zambian leader, Edgar Lungu that Zimbabwe will be stable and united ahead of next year’s polls. Mzembi spoke as he delivered a special message to Lungu from President Mugabe. Mzembi said Mugabe’s top priority at the moment were peace and stability. President Lungu said Zambia will continue to support processes for peaceful elections within the framework of the Southern Africa Development Community (SADC) principles of promoting peace and stability for both individual countries and the region as whole. He thanked the minister for the comprehensive overview regarding the political situation in Zimbabwe. 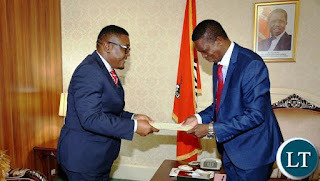 Mzembi also conveyed President Mugabe’s sincere gratitude to the Zambian Government for supporting Zimbabwe with affordable maize imports during the last four years of grain shortages in that country.